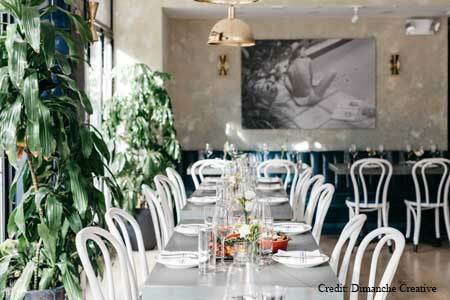 Stylish French restaurant in the up-and-coming Chinatown/Lower East Side enclave. About the restaurant and décor: Taking over the spot towards the beginning of Canal Street once occupied by two restaurants --- Les Enfants Terribles and then Skal --- Brigitte succeeds in being simultaneously chic and cozy. Dark wood tables, sleek banquettes and gleaming white marble counter seating create a space that is open and inviting, while antiquated walls, subtly illuminated by way of sconces, add intimacy. 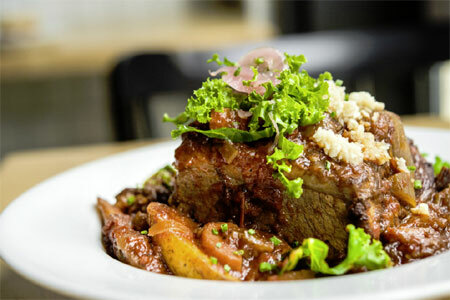 Likes: French classics are well represented on the menu, but there are creative and innovative departures from the standards as well. Dislikes: Tables were too closely spaced making the seating seem almost communal. Food & Drinks: Traditionally prepared French selections and those with global culinary infusions make up the creative menu. Among the smaller plate offerings, a crispy and flaky pissaladière topped with olives, anchovies and onions is classically Provençal in origin and flavor, while refreshing passion fruit and lemon scallop ceviche served with yuka and plantain chips has South and Central American culinary roots. Pair the former with a glass of white Bourgogne and the latter with a sparkling rosé from the French regional wine list. Large plates are well executed. A whole sea bream, deboned and seasoned with lemon, thyme and rosemary, is moist and delicate. Sancerre is a good complement to this dish. New Zealand lamb chops, accompanied by grilled leeks, are tender and juicy with mildly pungent and savory flavors. Both of these choices have a more French and Mediterranean, rather than global, character. Sides of roasted potatoes, grilled asparagus and Provençale tian, a casserole of eggplant, tomato, squash and zucchini, are ideal accompaniments. Do not pass up a dessert of buttery apple tarte fine with salted caramel and vanilla ice cream.